Many archeologists around the world consider modern day Iraq as the “cradle of civilization”. Between 3500 and 1900 BC the Tigris and Euphrates river were the home of the Sumerian people who prospered in this region. It is there were in the distant past, before written history, our planet was visited by astronauts from another world, intelligent beings with technology beyond our own today: The Ancient Anunnaki. The Ancient Anunnaki were always represented in a humanoid form, even though numerous traits indicate clear differences between the Anunnaki and ordinary humans. The facial features of the Ancient Anunnaki Gods were alway well-hidden thanks to the large beards, and even though their facial features indicate a clear similarity with humans, there are many aspects that have led numerous researchers to suspect there is something off with the depictions of the Anunnaki Gods. Is it possible that there are certain features of the ancient Anunnaki which were excluded on purpose by the ancient Sumerians? While this remains a mystery today, there are a few traits that stand out and are worth mentioning. These traits seem to indicate clear differences between the Ancient Anunnaki and mortals that inhabited the planet before written history. In 1976, author Sitchin published his personal translations of the Sumerian texts in a series of books called “The Earth Chronicles“. According to Sitchin, the clay tablets describe an alien race known as the Anunnaki who came to Earth to mine gold. Sitchin practically suggests that extraterrestrial visited earth in the past because their home-planet needed gold to survive. Information about the Anunnaki is extremely limited and most of the history surrounding their existence are filled with controversy. However, from a historical view, we find numerous details that tell us a lot about the mysterious Anunnaki. In ancient Babylon, the term used to describe the Anunnaki was ‘SIR’ which translated means ‘dragon’ or ‘big serpent’. The Ancient Anunnaki God ‘Enki’ was believed to have belonged to the so-called Brotherhood of the Snake. The symbol associated with Enki were the two coiled snakes of the caduceus, a symbol associated with our current medical symbol, but it could hide up to 3 types of meanings in ancient times: the Reptilian nature of the Anunnaki, drawing connections between them and the alleged reptilian alien race. The Reptilian Genetic Symbol indicating similarities with the human DNA. Spiritual Knowledge: In ancient Times in different cultures the ‘coiled snake’ symbolized knowledge and spiritual wisdom. However, there are many specific traits of the ancient Anunnaki that we have seen. The mysterious ‘bag’ the ancient Anunnaki depict is without a doubt one of the most mysterious traits representing the ancient Anunnaki. According to Sitchin, and other researchers, the mysterious ‘bag’ is some sort of box where the ancient Anunnaki deposited the so-called Water of Life”, something like a mobile Gene Banks used in their genetic experiments, not only on humans, bu also in animals on our planet. Another object specifically present in ancient Sumerian art is the mysterious bracelet, eerily resembling modern-day wristwatches. 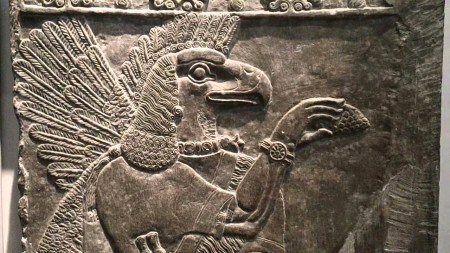 This has been interpreted by many scholars as simple bracelets without greater importance, however, according to many people around the globe, the enigmatic ‘Anunnaki bracelet’ had a far more enigmatic meaning than modern-day researchers are willing to accept. In addition to the enigmatic bags, and wristwatches, other elements are specific of ancient Anunnaki depictions. 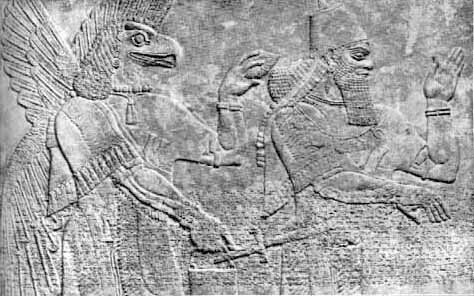 In most carvings where the Anunnaki are represented, we see the ‘God’ holding some sort of pinecone with his right hand. The enigmatic pinecone holds a very important meaning according to numerous researchers. According to David Wilcock, the pinecone symbolizes the pineal gland. According to Wilcock, the Anunnaki knew how to stimulate the pineal gland in order to extract its full potential, making full use of it.